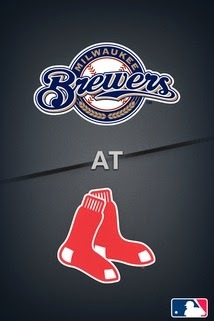 Two games at Fenway Park. Two losses in the last at-bat. The Boston Red Sox have experienced heartbreak on back-to-back nights in losing the first two game of their Interleague series with the Milwaukee Brewers. Boston sends ace Jon Lester to the mound in hopes of avoiding a home sweep to the Brew Crew. Lester pitched to form in his first outing of the year in Baltimore. He went seven innings and allowed two runs on six hits with eight strikeouts, but was the victim of a lack of run support in a 2-1 loss. Lester aims for his first win of the season and the first Sox win at Fenway. If Lester was good on Opening Day, Yovani Gallardo was better for the Brewers. Gallardo shutout the Braves over six innings and allowed four hits in picking up a win in the season opener. Although John Farrell explained that Saturday was a planned day off for David Ortiz, he noted the DH has dealt with some tightness in his right calf since Spring Training. Ortiz sat on the bench alongside Mike Carp (back) and Will Middlebrooks (right calf), both of whom were scratched late from Saturday's lineup. It was announced this morning that Middlebrooks will head to the DL with a calf strain. Shane Victorino and Craig Breslow, who are also on the DL, join Oritz, Middlebrooks, Carp as four regulars and a relief pitcher have already missed action. Given a 2-3 record and that the Sox have been "in" all three losses, things aren't so gloomy right now. Note: Brock Holt was recalled from Triple-A Pawtucket to join the Red Sox and replace Middlebrooks on the roster. Newcomers Burke Badenhop and Edward Mujica haven't impressed thus far, both saddled with a loss against the Brewers. But the rest of the Red Sox bullpen has been nearly flawless. Five Sox relief pitchers are averaging double-digit strikeouts per nine innings and haven't allowed a run over a span of 13 innings.